NASA is looking into rail-launched scramjets, air-breathing jet engines driven my supersonic combustion. Early designs envision a 2-mile-long track at Kennedy Space Center shooting a Mach 10-capable carrier aircraft to the upper reaches of the atmosphere (see below). Then a second stage booster would fire to lift a satellite or spacecraft into orbit. The scramjet launcher project could form the foundation of a future Advanced Space Launch System, with elements spread across different NASA centers to make it work, agency officials said. But there are some challenges. 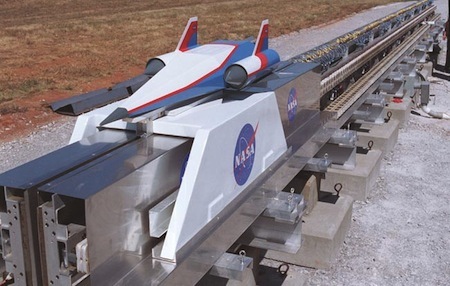 To launch on an electrified track, for instance, the track would have to withstand at least 10 times the speeds commonly seen on tracks used for roller coasters, NASA scientists said. Roller coasters typically run about 60 mph (100 kph), they added. SF fans recall the 1933 novel When Worlds Collide by Philip Wylie and Edwin Balmer. In the story, an astronomer discovers that a pair of planet will soon blunder into the solar system. One will destroy the Earth, the other will assume a stable orbit. Scientists work to build a ship that will transport enough people and earth animals and plant to the new world. 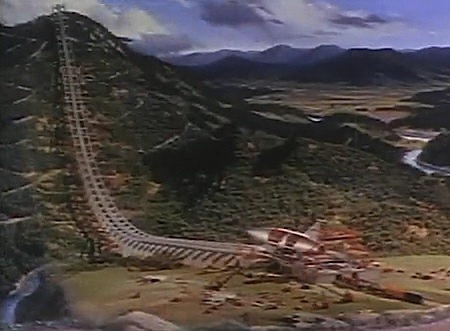 The 1951 film adaptation shows this rail-launched craft. Take a look at the full trailer for When Worlds Collide. Via Space .com; thanks to Randall Glenn Modesto for submitting this story.